Chess has been developing in Yugra for a long time. The World Chess Olympiad will be preceded by a chess horse relay race among the member countries, and "the earth-to-space" game will be held during the games. The northern Russian city of Khanty-Mansiysk (1900 km east of Moscow) will host the World Chess Olympiad for the second time in 2020. The decision by the General Assembly of the International Federation was that Olympiad would be held in the capital of Yugra, making it only the fourth city in the world to win the right to host the Games twice. "Our goal is to hold the 2020 Olympiad as the most open and accessible one. A simultaneous game will be organized on an area of 500 thousand sq. km,” said Natalia Komarova Governor of Yugra region, whose capital is Khanty-Mansiysk,. Earlier, Yugra hosted the games in 2010, at which nearly 2,000 players from 149 countries around the world came together. An equal number of participants are expected to attend in 2020. Additionally, the Olympiad is likely to make it into the Guinness Book of Records. The Yugra authorities intend to organize the first ever games between the Earth and Space, arranging a grandmaster blitz tournament with the ISS crew. An equally interesting idea is to hold the Olympic torch relay on the eve of the competition. It has been suggested that the symbol of the Games – the chess knight – be carried through all the participating countries, while conducting online tournaments during each stop, as well as meetings for young players with the grandmasters. This would promote the game of chess worldwide, believes Governor Komarova. Chess has been developing in Yugra for a long time. The region is the only one in the world to have held four World Cups in seven years, in addition to the Olympiad. The international chess tournament here, named after Anatoly Karpov, has been regularly held since 2000; it is included among the four most prestigious international competitions. Poikovsky village, where the competition is held, is known across the world as one of the capitals of the chess world. Yugra annually organizes almost 50 events aimed at popularization of chess among the population. "There are no days off when the Yugra Chess Academy is empty", says Galina Kovaleva Director institutions. They are not only competing behind the real boards; Yugra is also one of the world leaders for online tournaments. Around 1500 players from around the world participate in online matches every year. People with disabilities are also involved in the great chess family. A championship for people with musculoskeletal disorders was held here last year for the first time. Tournaments for the blind are also organized. Yugra went further this year. Chess, which was formerly taught in groups and сlasses, has become a compulsory subject in schools. They were introduced into the initial link on September1, and from next year, they will be added for high school students too. A total of 230 teachers have already been trained to teach the new discipline. 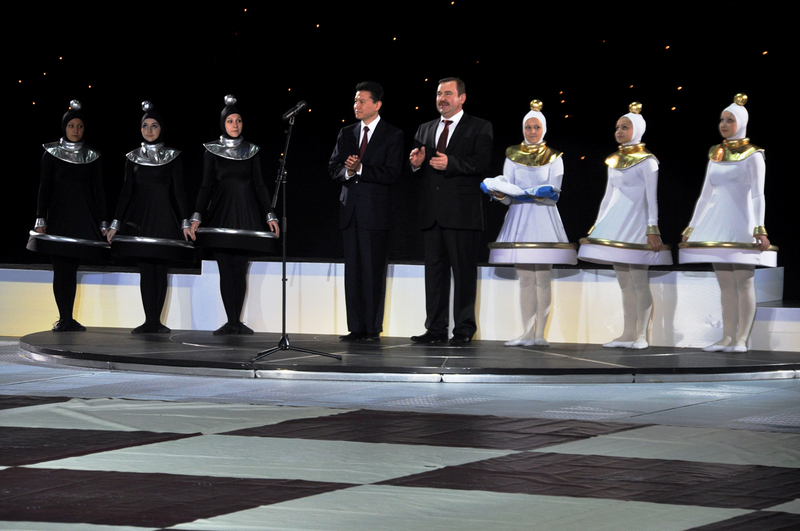 According to Kirsan Ilyumzhinov, president of the International Chess Federation, FIDE is committed to ensuring that chess is studied in all the member countries of the federation all over the world. It has long been practiced in some of them. Yuri Orlik, a professor of the Federal University of Latin American Integration noted in 2013 that, in Brazil, such a programme had begun in schools in 1980; it was launched by grandmaster Sunie Neto in the state of Paraná. Later, chess appeared in other territories. Teachers noticed that student achievement increased by 18 percent after the programme was introduced. A special lesson of this kind is underway in India today. Chess is taught twice a week in the state of Gujarat, which has been the first to introduce such a programme in the country. Chess is honoured in China where, at the beginning of the lesson, children spend 10-15 minutes warming up at the chessboard, and only then do they study mathematics and literature. Chess is taught in kindergartens and in schools in China, for which the country allocates millions of yuan. The material was prepared with the assistance of Department of Community and External Relations of Yugra.